Grown-Up Mac and Cheese – Nutrition.Health.Life. As a kid, J and I both loved macaroni and cheese. How were we to know that it wasn’t made with real cheese? Thankfully, we’ve come to see how much more amazing this childhood favorite can be. I’ve made a number of takes off macaroni and cheese before, but this is probably my favorite. We don’t plan to feed Eli the box mac and cheese, so we’re hoping something like this will be his favorite go-to childhood meal. Give it a try – I promise you won’t be disappointed. Prepare pasta as directed on package; set aside to cool. Heat olive oil in a skillet. Add onion, salt, and garlic. Cook down until soft. Add vinegar and cook for 1 more minute. Set aside. Pour 1/2 cup milk into a measuring cup. While whisking, slowly add flour, making sure none sticks to the bottom. Once fully incorporated, add remaining milk and whisk well. Spray a skillet with cooking spray and pour milk mixture into the room-temperature pan. Heat pan over medium-low heat, stirring continuously to prevent sticking. Continue to heat until the mixture begins to bubble. Once slightly bubbling, allow to bubble while stirring for 3 minutes (this is the thickening stage) and then lower heat to low. Add cheese to the white sauce and stir until fully melted. 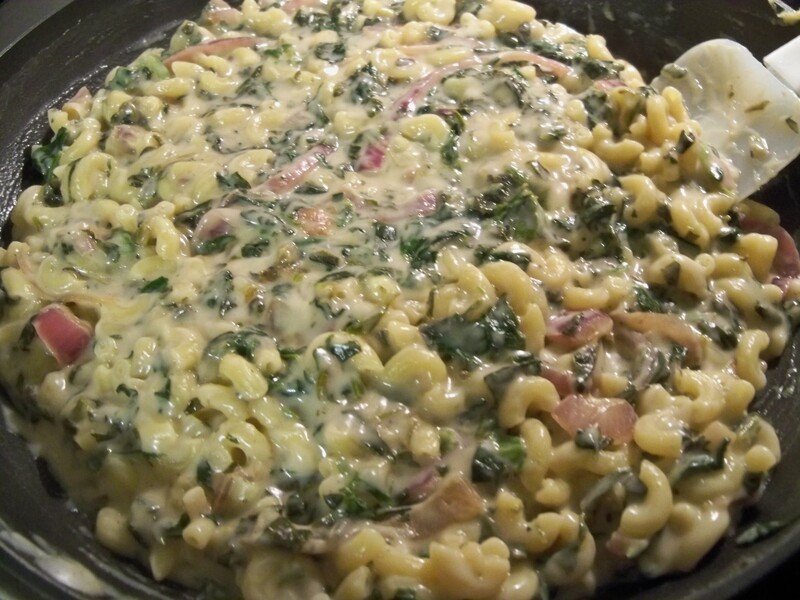 Add onion, chicken, spinach, and pasta; mix well until well incorporated. This entry was posted in Nutrition and tagged cheese, chicken, dairy, Greens, pasta, Recipe Makeover, vegetables. Bookmark the permalink.